Learn how to disassemble and reassemble a twist shifter to replace the inner shift cable. 01:14 - Take the shifter apart very slowly to avoid losing important components. 02:00 - Getting the shifter back together correctly can be really tricky and takes some patience. 02:28 - Watch the front and rear derailleur adjustment tutorials for more help with this step. Today we’ll learn how to replace a Sram GripShift(R) style shifter cable. For this job, you’ll need a replacement shift cable and end cap, a 2.5mm allen key to open the grip shifter, a 5mm allen key or 9mm open end wrench to loosen the derailleur pinch bolt and brake levers, a cable cutter to trim the cable and pinch the cap, some light oil to lube the cable housings and a tiny bit of waterproof grease for inside the shifter. The first step is to remove the old cable. Shift either your front or rear derailleur to the smallest sprocket and cut the old cable cap off. Then loosen the pinch bolt and slide the inner cable out of the derailleur and cable housings. Now loosen your brake lever and slide it along the handlebar so we have room to open the grip shifter unit. Turn the shifter to the highest gear if you’re replacing the rear cable, or the lowest gear if you’re replacing the front. You’ll notice a small allen bolt on the outside of the shifter body. Loosen this off but don’t un-thread it completely as they are really easy to lose. Once the shifter turns freely on the handlebar, jiggle and pull the grip apart until it separates into two parts. Sometimes it helps to very gently pry it open with a flat screwdriver. Now you’ll have to be extra careful. The first thing watch for is a tiny piece of oddly-shaped metal sitting on the inside of the shifter. It’s really important to keep that spring exactly where it is as the shifter won’t function without it. Slide the old cable out of the shifter and pay careful attention to how it was wrapped around inside the shifter. The cable usually wraps around once and sits in a little groove. Apply a tiny dab of grease to the grooves where the cable sits inside the shifter. Slide the new cable back into the shifter, loosely wrap it around once, and then slide it through the shifter body. Now pull the cable tight and set it down into the shifter grooves the same way it came out. If it looks right, push the two parts of the shifter back together and try turning the shifter. If the cable is installed correctly it should click and turn normally. Slide your brake lever back into position and tighten it. Now turn the shifter so the cable is tucked up under the brake lever and tighten it as well. Drop a little bit of light oil into the cable housings before installing the new cable. Thread the inner cable back through the housings and the derailleur pinch bolt. Make sure your shifter is in the smallest sprocket and then pull the cable tight and tighten the bolt. 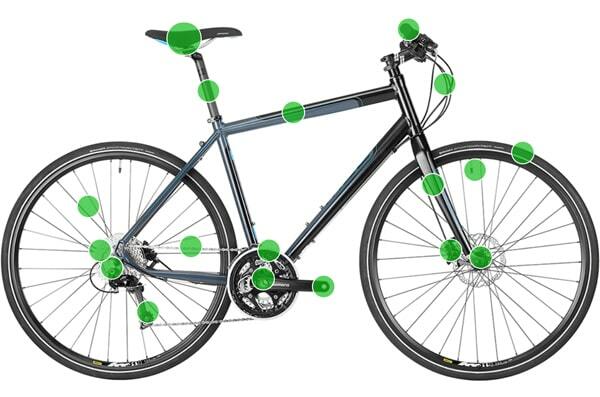 Now run through the gears and adjust your front or rear derailleur as needed. The last step is to cut the excess cable off about two inches past the pinch bolt. Then slide on the aluminum cap and just partially squish it 2 or 3 times with your cable cutter so that it stays on. This will keep the cable from fraying.